It can be tough to make the leap to stardom when you play in a small market. While Atlanta has been a basketball collecting wasteland for many years, Jeff Teague is a big reason that the Hawks have pushed their way to to the top of the Eastern Conference. Collecting interest has slowly increased for Teague based on the team's success, but prices largely remain on the lower side. 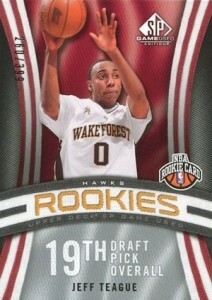 If Atlanta can finally make some noise in the playoffs, look for Jeff Teague rookie cards to start pushing higher. Shop for Jeff Teague rookie cards on eBay. The 19th overall pick in the 2009-10 NBA Draft, Jeff Teague started off slow and did not see considerable playing time until his third season in the league. Since then, Teague has seen his points per game average increase in each season and he received his first All-Star selection in 2014-15. 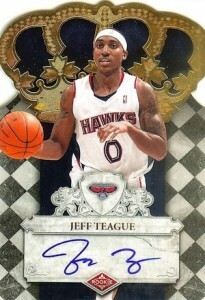 Collectors can find Jeff Teague's rookie cards in 2009-10 products. While that includes Panini and Upper Deck products, Teague was not available in 2009-10 Topps products, which was their final season in basketball. Two Jeff Teague rookie cards stand above the rest and are highlighted below. Despite the fact that over half of his rookie cards are autographs, most remain reasonably priced. Crown Royale and Contenders are two other options to keep an eye on because they are both on-card autographs. Teague's card in SP Game Used is notable as it is his only unsigned rookie card that is serial numbered. 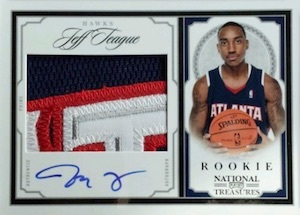 Easily the top overall rookie card for Jeff Teague, 2009-10 National Treasures features a large patch and low print run along with an on-card signature. 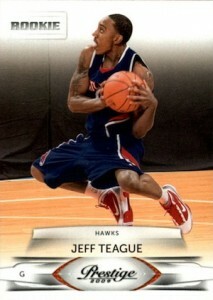 Despite the college theme, this Exquisite rookie card for Jeff Teague remains popular thanks to the brand's reputation and the higher print run keeps prices in check.